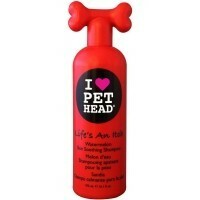 Pet Head Lifes An Itch Shampoo has been developed to help relieve skin irritations caused by insects and dry skin, and contains both oatmeal and aloe vera which work together to soothe the skin. Scented with a wonderful watermelon scent, the shampoo also contains Tea Tree Oil, Wheat Protein, Vitamins and Chamomile Extract which help to purify, fortify and moisturise hair follicles while nourishing the skin and leaving the coat silky and conditioned. Wet the coat completely with warm water and apply the shampoo gently, working back towards the tail. Lather well into the coat avoiding eyes and ears. Rinse thoroughly and towel dry.